Jr. Beginner Novice champions Ella Robinson and Fernhill Fearless des Terdrix. Photo by Leslie Wylie. That’s a wrap for the 2018 American Eventing Championships presented by Nutrena! 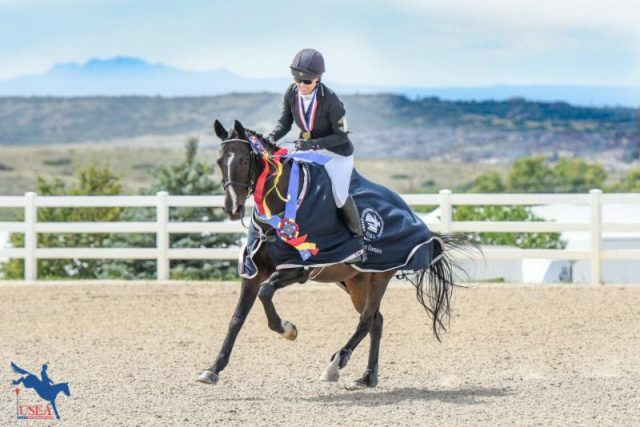 A final round of winners were crowned on Sunday here at the Colorado Horse Park. 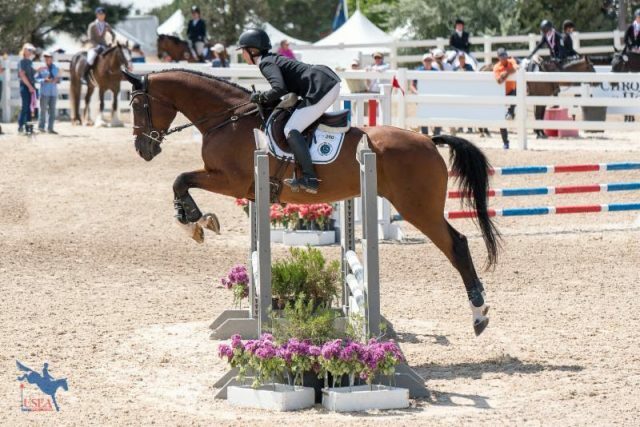 Check out our Adequan USEA Gold Cup Advanced Final recap here (go Tamie Smith and Mai Baum! ); for Intermediate and Beginner Novice, you’ve come to the right place. Once again we have the hardworking USEA/Colorado Horse Park press teams to thank for chasing down the winners of each division to collect their reflections on the week. Charlie Tango is used to being an AEC Champion having won the honor a whopping three times: Preliminary in 2014, Intermediate in 2015 and once again at the Intermediate level today. 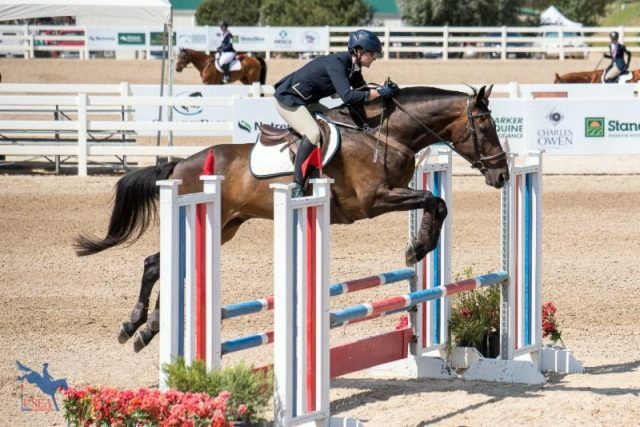 With all that experience, Heather Morris was able to ride Team Express Group, LLC’s 2008 Irish Sport Horse gelding (Shannondale Sarco St. Ghyvan x Our Queen Bee) to a perfect weekend. The pair added nothing to their dressage score of 25.8 to win wire-to-wire by over five points. “He was great. I was a little rusty actually, I hadn’t ridden in three weeks because I threw my back out, but it all worked out in there,” said Morris. Morris and ‘Chuck’ came into show jumping with a rail in hand, but they didn’t even need it as they easily cleared Marc Donovan’s course. “He was weird at the liverpool at Rebecca Farm, so I was a little worried about that, but he jumped great. I had a few errors, but he handled it well. It was lovely to be in the International Ring here, and the course was lovely. He loves the crowd and the atmosphere so it went well,” said Morris. “It’s a long way home, about 24 hours, but thankfully we had a great weekend,” continued Mowbray, who traveled from California to compete at the AEC. 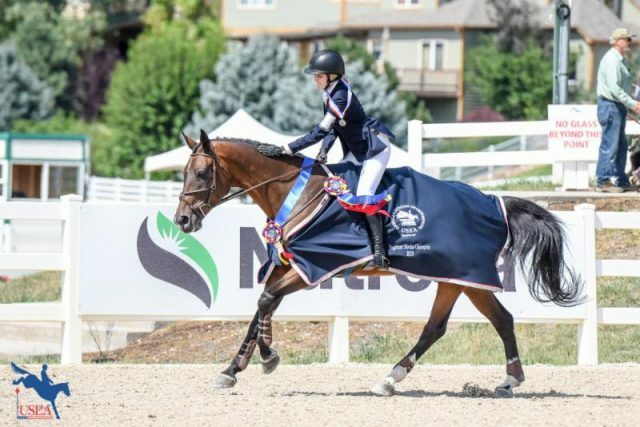 The journey was a bit closer than the 2017 AEC in Tryon, N.C., where Mowbray and En Vogue finished fourth in the Preliminary Horse division. Kellerhouse and Woodford Reserve, her own 2009 Irish Sport Horse gelding (Tinarana’s Inspector x Laharns Laughton), started the weekend in second place, but some time on cross country dropped them down to fourth. However, a double clear show jumping round boosted them up to finish in third. 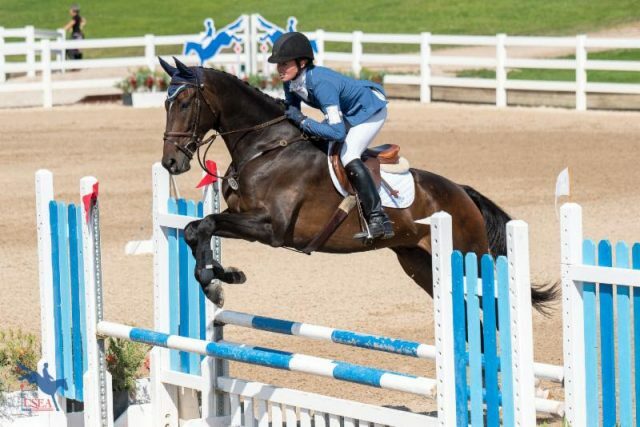 “He’s a really good show jumper and I knew if I didn’t mess up, we’d go clean. He’s really careful and he gives me a lot of confidence in there because he’s brave and careful and he just does his thing,” said Kellerhouse. 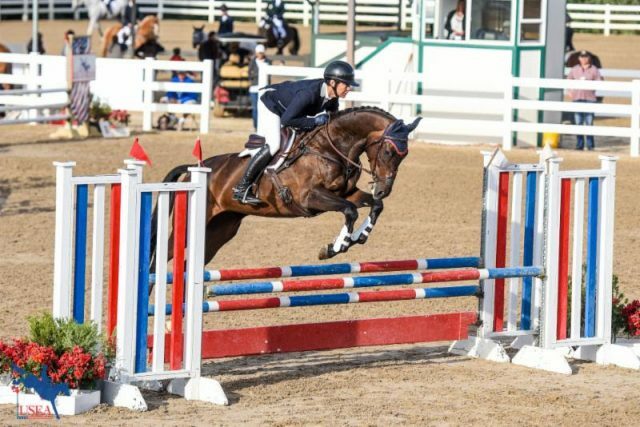 The Novice Horse division welcomed yet another victory for California native Tamie Smith, as the fierce competitor took to the final show jumping phase with the MB Group LLC’s 2013 Oldenburg gelding MB MaiStein. The duo scooped up the tri-colored ribbon after landing on 28.1 total penalties. 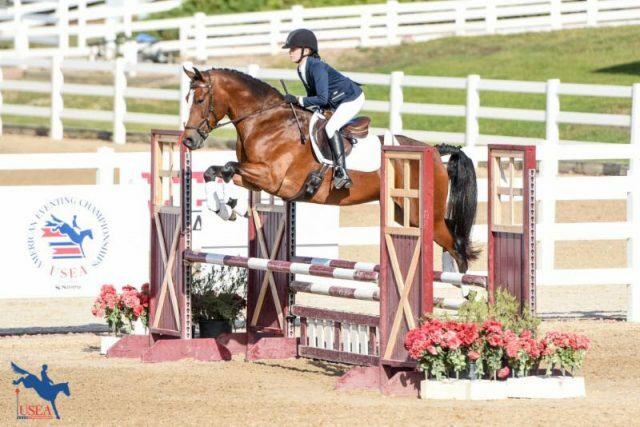 Amanda Boyce of California and Mercury, her own 2006 Welsh Cob gelding, went into today’s show jumping sitting in second place and maintained her competitive edge to finish on top of the Junior Novice division. “My trainer and I have a system, which is zip (forward), counter bend, steady, and then quick — we’ve been practicing that a lot,” said Boyce. 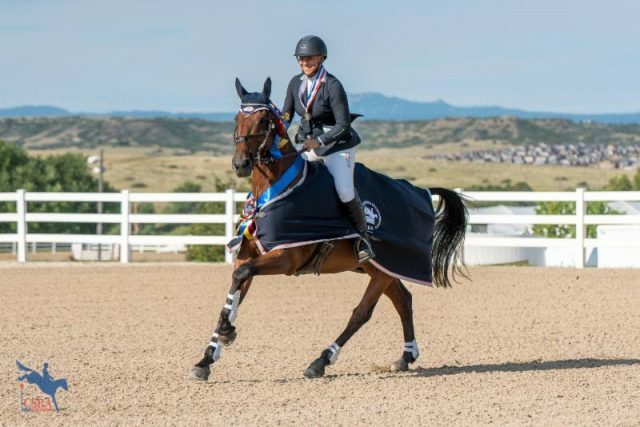 Colorado native Erin Contino maintained her three-phase lead, concluding the week with a blue ribbon in the Novice Amateur division aboard her own Handsome Ransom, a 2012 Thoroughbred gelding (Desert Warrior x St. Casmir’s Secret), on their dressage score of 25.8. Anna Howell and her own Bodacious Affair, a 2003 Thoroughbred/Shire gelding (Kaeson’s Tuxedo Affair x Exclusive Ballerina), steadily climbed the leaderboard all weekend, sitting in third after dressage on 25.2, adding nothing to their score on cross country to move into second, and finally jumping double clear this afternoon to take home the win. 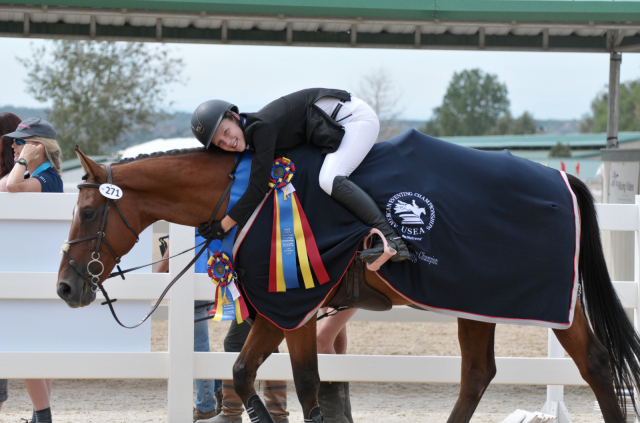 The Beginner Novice Rider division was championed by Tricia Leslie of Colorado and her own Inate Dignity, a 2006 Thoroughbred gelding (Subordination x Indygo), as the duo finish atop the division on a score of 27.3. Tricia Leslie and Inate Dignity. Photo by USEA/Leslie Mintz. Area V rider Patti Champion, of Texas, guided Invincible, her 2009 Thoroughbred gelding, to second place on a 32.2. Lindsey Kahn of Minnesota and Seoul Sister, a 2010 Thoroughbred/Connemara mare (Firebee x Limerick Lace), collected third place on a final score of 33.3. Champion agreed with Leslie’s compliments about the excitement of a Midwestern AEC. This was the mother of four’s first time competing out of her Area, and the weekend ended on a high note for her and her mount. “Vince and I have been together for two years, so we’ve worked really hard to get here. We’ve just had so much support from the kids, and my trainer and my husband,” she said. Kahn also found herself at the top of the leaderboard after a consistent week of competition, moving up from 11th place after dressage to third following both a fantastic cross country and show jumping round. “It’s just been an awesome journey learning to trust each other. She’s a very brave mare, so I always have fun with her at competitions so riding her here is a huge honor,” said Kahn. Alexa Ehlers and Clear Laveer, her own 2006 Hanoverian gelding (Rascalino x Hauptstutbuch Wincenta 2), led the Beginner Novice Horse division wire-to-wire on their dressage score of 27.4. Alexa Ehlers and Clear Laveer. Photo by USEA/Jessica Duffy. Ella Robinson and Fernhill Fearless des Terdrix, her own 2010 Dutch Warmblood gelding (Nabab de Reve x Untouchable), waited patiently in the wings all weekend on their dressage score of 30.3, moving from equal third to equal second after cross country and taking home the win with the cross country time closest to optimum time. Ella Robinson and Fernhill Fearless des Terdrix. Photo by Leslie Wylie. Maya Pessin and This Bird, her own 2009 Thoroughbred gelding, sat tied with Robinson and ‘Fearless’ all weekend but were nearly 40 seconds faster on cross country, putting them in the Reserve Champion position on the leaderboard at the end of the competition. Click here to view a full list of results!